A pork belly gives a lot of bang for buck. It’s a cheap cut that benefits from simple, hands-off cooking. A few herbs, some salt and pepper and a few hours in a low oven are all you need. A cut from the thick end of the belly weighing between 1 and 1.5kg is best, on the bone, the skin scored with a craft knife. Your butcher should do this for you, and if he doesn’t or won’t, you need to get a better butcher. Grind two teaspoons of fennel seeds and three teaspoons of coriander seeds with a pestle and mortar. The aim is to crack and break the seeds, not to grind them into a powder. Sprinkle the scored skin of the joint with salt and pepper, and rub about half of the spice mix into the skin, pushing it deep into the score marks. Place the joint in a roasting tin and pour the rest of the spices into the bottom of the tray, where they’ll flavour the fat that renders from the meat. Start the roast at 220c for thirty minutes. 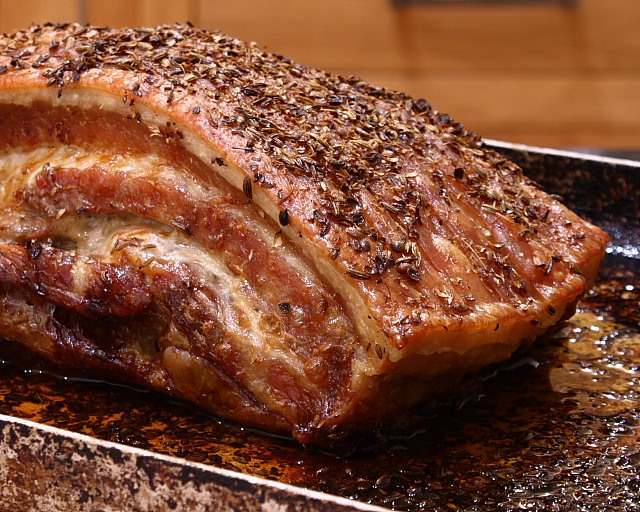 The initial blast of heat sets the crackling and guarantees a crispy finish. Turn the heat down to 180c for another ninety minutes. You could go lower, to 140 or 150c, and cook for longer, upwards of three hours. No harm will come to the meat. Let the joint rest for at least twenty minutes before removing the crackling in one piece and snapping into small pieces, and carving the meat into long, succulent strips. The snap of crackling is one of the most satisfying sounds any kitchen can produce. The bones should be left to cool, then sliced into small spare ribs and gnawed away with a good chutney or relish. Serve the pork with mashed potato and a green vegetable such as cabbage or broccoli, in a vain attempt to balance the fattiness of the meat. The vegetables are there only for show. There’s no point pretending that this is a healthy dish, so you might as well undo this token nod towards healthy eating by spooning some of the delicious pan juices over the potato. I have tried this recipe, but with a different rub. I roasted the belly after rubbing the inside with crushed sage, black pepper corn and maldon salt, then spritzed with fresh lemon juice. The roast is then tied into a tight roll and roasted for about 40 minutes. mmmm….looks very delicious. Though I love to eat healthy, I don't mind an occasional indulgence…..the fattier, the better! This one just looks perfect for me. Pork is definitely underrated. This looks divine. I love me some crackling! I'm half tempted to lick my screen to see if that photo tastes as good as it looks. 🙂 This is definitely going on the shortlist of recipes to try as soon as I can get my hands on all the ingredients. That looks absolutely amazing. Belly is my favorite part. mmmmmm….pork fat. Nothing says fall like the smell of braised pork. last time i saw a stunningly beautiful roasted pork belly picture was from jamie oliver's cookbook. yours is very competitive! What a handsome looking meal. The spices look heavenly. I don't normally crave that fennel flavor, but for this, I'd be tempted to eat the whole thing! Hmmm – I have a pork belly joint in the freezer. I might follow your lead and change my flavourings for this one! Your answer shows real inetllgience. Just looked this up for reference – comparing as I always do, four or five different recipes from both sides of the atlantic. HFW’s always reliable so I shall try this with the pork belly I bought earlier. It’s just occurred to me to brine it (probably should be longer than the 13 hours it’s going to get, but hey). It might have been Hugh or it might have been Nigel Slater – not sure but probably a Guardian influence anyway, some years ago, got me into brining, but it got me into brining. A little like the Mexican way with chicken – joint it, skin it and use a sugar, onion and vinegar rub for a few hours / overnight before casseroling it – or making a mole.